(First published in the Dynevor School Magazine, 1975). A peaceful afternoon in the summer of 1968 was interrupted by the arrival of a friend. He had concluded that by principal preoccupations of thumb-twiddling, whistling and staring blankly at the sky were neither productive nor profitable even if the three activities were performed simultaneously. I decided that here was a wise-guy who knew very little about the gentle art of doing nothing and challenged him to suggest an alternative way in which I could pass my spare time. With the best of intentions, he invited me to join him in his particular pastime, angling. It seemed ludicrous. My only fishing experience to date had involved balancing precariously on the bank of a stream with an old jam jar and a net. However, I agreed to give his suggestion a little thought and, perhaps with a little sarcasm, remarked there might well be a future for me in the British fishing industry. During the next few days I invested in some moderately priced tackle and I was soon to be seen heading in the direction of Brynmill Lake, armed to the teeth with a rod, reel, line, floats, weights, disgorgers and other ‘essential’ knick-knacks of which I knew almost nothing. With a great deal of assistance my line was set up and baited. I had brought some old bread to use as bait; this was mixed with water until it had a doughy consistency and a small lump was attached to a hook. First, you release the reel catch, hold the rod high with the tip pointed backwards across the right shoulder and press the line to the underside of the rod with the index finger. Then you fling the rod forwards with great vigour, releasing the index finger from the line and the weights will do the rest. It sounded easy. I thought it would work. It almost did. The rod at least was pointing in the right direction – across the lake. Most of the line, however, was tangled around my arm and the hook, weights and float were hidden somewhere in an adjacent bush. Eventually, I mastered the technique and all went well. My only worry was that, whenever I reeled in, the bait had mysteriously vanished. Naively, I attributed this to a fish that had failed to become hooked. In reality, I suppose, the bread had either broken up in the water or flown off during casting but ‘the one that got away’ theory held most appeal and anyway, who could prove otherwise? After a fortnight I had well and truly settled into my new-found recreation, despite the ever-present awareness that I was being denied the apex of relaxed angling. Occasionally, the line would drift into the bank. 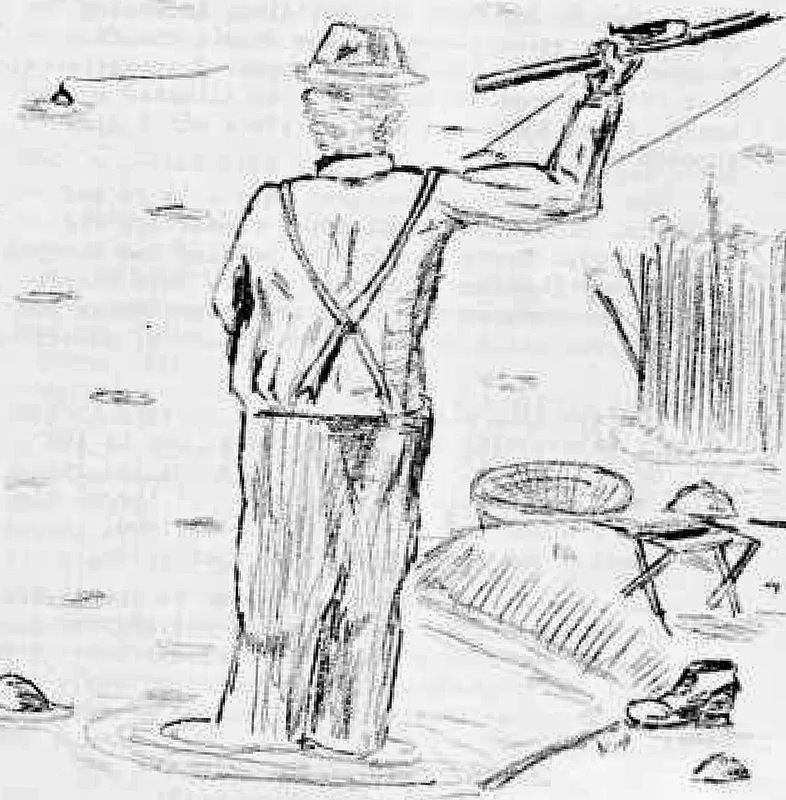 It mean the disturbance of having to rise and re-bait the hook and, far worse, the activity of standing to cast the line back into the water. A remedy would have been to dispense with the angling side of the outing altogether, of course. One afternoon it dawned on me that a major milestone in my ‘career’ still had to be reached: I had not yet caught a fish. Logs, weeds, pieces of debris I had caught, but no fish. I resolved to change by bait. I secured a large box of worms but my friend had gone one better. He appeared on my doorstep and gleefully announced that he had visited the abattoir. From his excited mutterings I gathered that he had procured a substantial supply of cream-coloured maggots. An expedition was arranged for the following day. The next day dawned but the weather had become somewhat sour. As I began to think of an alternate set of arrangements for the day, the telephone rang. It was my accomplice who enquired whether I still intended to go fishing. When I replied that the bad weather had left me in some doubt, he replied knowledgeably that it was a good day for fishing since they always bite in the rain. Within an hour we were again at the lake-side, carefully baiting our hooks and becoming more bedraggled by the minute. We cast out. After about ten minutes, I noticed my float bobbing beneath the surface. I leapt to my wellington-clad feet, grabbed the rod, reeling in at the end of my line was my first fish. Immediately I was overtaken by a tremendous feeling of achievement and in the teeming rain, danced a series of spectacular gyrations which bore a strong resemblance to the highland fling. My performance over, I released the poor perch from the line and returned it to its watery home. From then onwards my interest declined and a large part of each expedition was spent feeding the ducks, who apparently thrived on stale sliced bread. Subsequently, outings became shorter and shorter until they eventually ceased, much to the relief of other, more serious, anglers. Then about two or three years ago I sold my tackle and made a small profit. It had been worth it after all!